When you were at school, you may have agreed with so many current students that ‘seeing your friends’ was by far the most significant positive about school. This has been said to me in numerous schools of all types. These same schools all claim to have modern blended-learning environments (real+online). So, why has the internet and millions of dollars in technology around the world seemingly made little difference to the significance of learning at school? Increased achievement thanks to the opportunities offered by mixing on-line and off-line learning hangs on one important point – a teacher’s mindset that allows these opportunities to flourish. What the internet doesn’t change, is the feeling you are doing someone else’s work. If a school culture expects teachers to drive all learning and make decisions about what, how, and when things take place, then the internet and technology in general are only viewed as an extra means to comply and complete. This does not develop learners who are ready to adapt to 21st century employment. To only learn online is to miss out on the crucial social aspect of learning and problem-solving. To ignore the important impact that technology has had on the personalisation of our world is equally dangerous. So more important than solely discussing technology is to take a look at a school culture that successfully allows learners the freedom to make the most of both worlds. In 2015, I was lucky to tour New Zealand, looking at best practice in education. I visited a school that had re-purposed their existing physical classroom / corridor spaces, and redesigned their timetable to create a whole new learning experience. I could see within 10 minutes that the students were more driven and positive about school than in most schools I’ve been to. It did this by dividing itself into a mini-schools within the site. 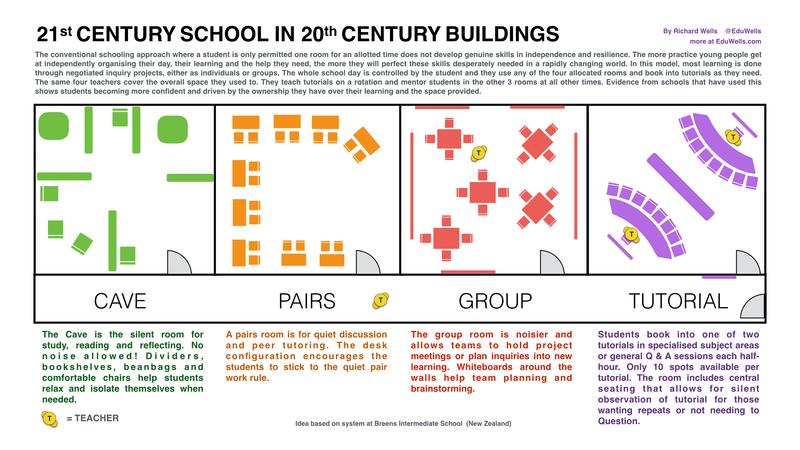 Rather than confine each student to a particular room from which learning would be ‘received’, every student had permission to design their own school day (every day) and had free access to up to 4 differently purposed rooms depending on what their needs were at any particular moment. This allowed them to make the most of the blended learning in that they, the students, expected to use technology when it made sense and not because it was instructed. a tutorial room (They had to book into tutorials that the teachers ran on a rotation). It was up to the children to use these spaces according to needs and be responsible for productive time management. Something that was very evident during my visit, where I could see that through practice and extensive experience in self-driven learning, the average student was more confident, organised and keen to discuss their progress. They also were less obsessed and ‘attached’ to their devices and other technology. It seemed a more genuine engagement with learning. Students are free to organised their own day. They had to book into a certain amount of tutoring in a week but by choice could tailor the tuition to their needs. They negotiated inquiry projects at the beginning of terms and worked on them in teams. They were encouraged to work together and solve their own problems. They also booked out technology from a central hub when required, rather than assume that technology was a must all day, like some schools suggest. Teachers rotate between giving tutorials and roaming as mentors. A nice touch is for the principal to be signing off the final projects. Teachers have more time to talk to students and guide teams in their negotiated inquiries. Teachers were happier through working with students who were intrinsically motivated to learn on projects designed by themselves. All the national curriculum and regular content was still covered and any direct teaching needed was available, just never in a one-size-fits-all approach. If the blend of face-to-face and online learning is designed by the teacher, opportunities are often missed in making learning meaningful for every learner. If teachers want to gain the most from technology, they must focus on developing in each learner a sense of self-awareness in how they learn best. Blending one’s own learning is the only truely future-ready blend.